Would you want to make a Journal quilt but you don’t know how to make it, today I’ll tell you how I made one. The main purpose to make a journal quilt is to learn more about quilting techniques, day by day we can read about new ways to make a quilt, from hand made to making a quilt with the best sewing machines that will help you to make a quilt in less than one day. I remember the first time I read about making a journal quilt on the internet it was about learning something new to work on a different block every month, at the end of the year I will have 12 different blocks finished. It doesn’t sound bad, as if you work on a single block every month, you will have enough time to work on it. This week I finished my first Journal Quilt, I began to work on it a few years ago, I need to be honest with you, I worked on making a block every month, but when I got 11 blocks finished this quilt got in a drawer and I never worked on it again. Next year I worked in a new Journal Quilt and I finished it, I made a wall hanging, this quilt is today in Puebla Mexico and it’s part of my private collection. The following year I made my third journal quilt and today it’s a wall hanging at my home in Canada. As 2017 arrived, I thought about making a new journal quilt this year, but I traveled to Mexico for a few weeks and I made the blue king size quilt and I didn’t have time to start a new journal quilt. A month ago I took this quilt out of the drawer and I began to work on it again, as I looked to each block, I decided I had to work a little bit more on each block, some more stitches here and there, adding little pieces of fabric here and there and then I worked to make the last block. 12 Blocks to make what? 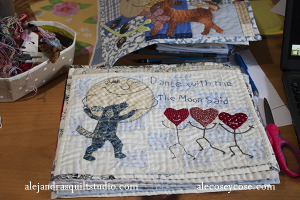 It’s how many quilters like to finish their journal quilts as a book, and I love this idea but not for this quilt. If I make a book of it, it will be kept in a box or in a drawer for ever, I like more the idea to make a small quilt of it as a wall hanging, this way I can hang it on a wall and I will look at it every day. Big or small, does the size matter? I don’t think there’s any rule about how big or small a block should be when you make this kind of quilts. As a rule, and because it’s easy to work on it, some quilters like to use the A4 paper size (8 x 11 inches) two of my journal quilts were made with this block size and I can say it’s easy to work on the blocks and it’s easy to share the patterns as a PDF file with other quilters. The quilt I finished this past week, blocks are bigger than A4 paper size, but I like the size of this quilt. If you decide to work on small blocks, it won’t take you lots of time to finish each block, and once you finish your 12 blocks you can keep them as a book or a small quilt. How small a block can be? As small as you want to, some quilters work on small blocks as 1 X 1 inch, they are called inches, there are many beautiful examples of mini quilts made with inches on the internet. 3 x 3, 4 x 4, or 5 x 5 inches will be a good small block size to try. 6 x 6, 7 x 7 or 8 x 8 inches will be a medium block size, you can work a little bit more on these blocs, work maybe on different stitches or some applications like I do on my journal quilts or a different quilting technique. Once you finish these 12 blocks you can keep them as a book or sew all the blocks together to make a small quilt. 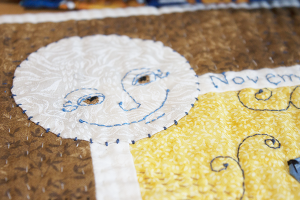 A small quilt can be perfect for a table runner, a wall hanging, a lap quilt or a baby quilt. How big is a large block? 10 x 10 , 12 x 12 or even 14 x 14 inches, you will be working on large blocks but the good thing about these large blocks is by the end of the year you will have 12 big blocks to make a quilt. 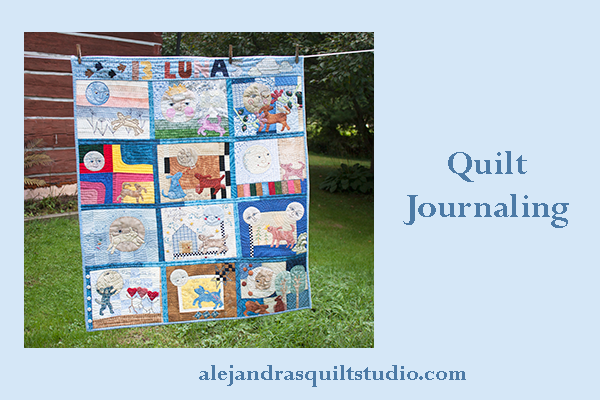 So many good things about a journal quilt I don’t see why not to make one! 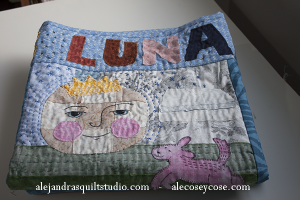 I decided to call this journal quilt 13 lunas, (13 moons) in Spanish for one reason, as I live in Quebec where multiculturism is part of life here and as a Mexican quilter is my mother tongue. 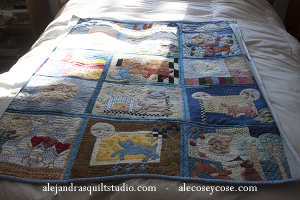 The year I made this journal quilt had a blue moon, that means there was two full moons in one month, and I worked on a story about one little dog that talked to the full moon every month. 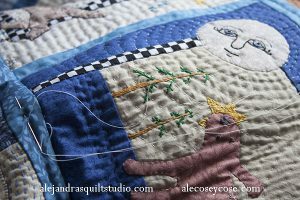 As I was working on this quilt these past weeks, I took a few photos of my work on different blocks, today I will share with you some of those moments. 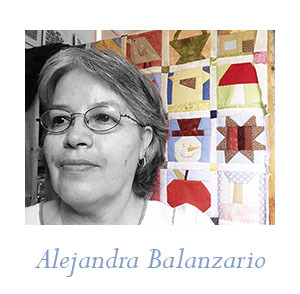 If you have any questions about this quilt, leave a comment here and I will reply to it, if you want to leave a comment on my Facebook fans page you can visit it at Alejandra’s Quilt Studio. Should I wait for 2018 to start my new journal quilt or not? I would love to hear what do you think! 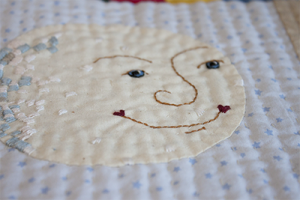 Would you like to work on your own journal quilt (free) along with me, as I work on my next journal quilt? I absolutely LOVE your journal quilt!!! What a great idea and how beautiful!!! Oh, thanks so much Mrs g!